At present, there are almost 2,500 man-made satellites in outer space. Despite this large number, information about satellite building, testing, and contracts are often securitized or confidential; however, a recently released photo from the European Space Agency (ESA) offers a rare glimpse into the built environment of satellite testing culture. The picture (viewable above) shows a room with 30 ft walls which are covered in hundreds of aquamarine spikes, all doused in mellow lighting. 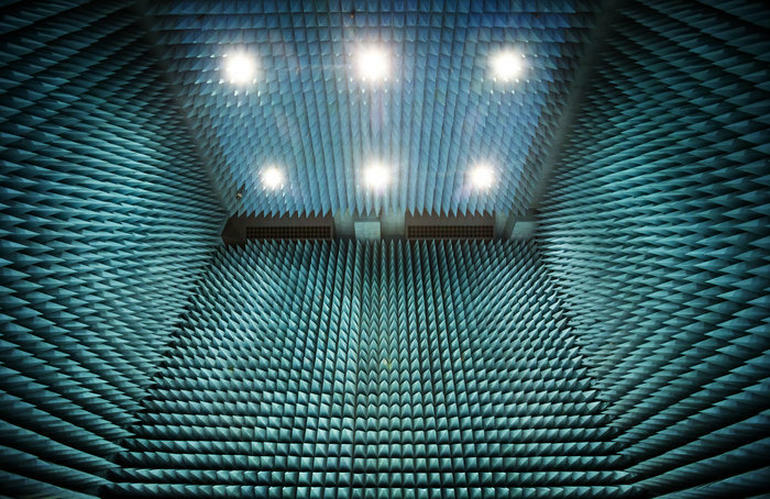 Called a Faraday cage, this room has been specially built to “[mimic] the infinite void of space” for the purpose of testing satellites prior to their launch into space. As such, the menacing-looking spikes are actually harmless foam, designed to absorb sound as well as any other signals produced in the room. Looking at this image immediately brought the work of Diane Vaughn, Donald Mackenzie, and Janet Vertesi to mind, due to their work related to earth-bound elements of space culture, be it in missiles, or rockets, or Mars. However, their work often is more focused on people who work quite directly with space (running the missions on Mars, building the missiles and rockets and so on). Looking at this photo makes me wonder about the people whose job it is to build the rooms and micro-worlds, spikes and lights, the very environments that make such larger projects possible in some ways. How do they figure in narratives of space and technology?